Henry Plantagenet, when he was but twenty-one years old, quietly succeeded to the throne of England, according to his agreement made with the late King at Winchester. Six weeks after Stephen's death, he and his Queen, Eleanor, were crowned in that city; into which they rode on horseback in great state, side by side, amidst much shouting and rejoicing, and clashing of music, and strewing of flowers. The reign of King Henry the Second began well. The King had great possessions, and (what with his own rights, and what with those of his wife) was lord of one-third part of France. He was a young man of vigour, ability, and resolution, and immediately applied himself to remove some of the evils which had arisen in the last unhappy reign. He revoked all the grants of land that had been hastily made, on either side, during the late struggles; he obliged numbers of disorderly soldiers to depart from England; he reclaimed all the castles belonging to the Crown; and he forced the wicked nobles to pull down their own castles, to the number of eleven hundred, in which such dismal cruelties had been inflicted on the people. The King's brother, GEOFFREY, rose against him in France, while he was so well employed, and rendered it necessary for him to repair to that country; where, after he had subdued and made a friendly arrangement with his brother (who did not live long), his ambition to increase his possessions involved him in a war with the French King, Louis, with whom he had been on such friendly terms just before, that to the French King's infant daughter, then a baby in the cradle, he had promised one of his little sons in marriage, who was a child of five years old. However, the war came to nothing at last, and the Pope made the two Kings friends again. Now, the clergy, in the troubles of the last reign, had gone on very ill indeed. There were all kinds of criminals among them--murderers, thieves, and vagabonds; and the worst of the matter was, that the good priests would not give up the bad priests to justice, when they committed crimes, but persisted in sheltering and defending them. The King, well knowing that there could be no peace or rest in England while such things lasted, resolved to reduce the power of the clergy; and, when he had reigned seven years, found (as he considered) a good opportunity for doing so, in the death of the Archbishop of Canterbury. 'I will have for the new Archbishop,' thought the King, 'a friend in whom I can trust, who will help me to humble these rebellious priests, and to have them dealt with, when they do wrong, as other men who do wrong are dealt with.' So, he resolved to make his favourite, the new Archbishop; and this favourite was so extraordinary a man, and his story is so curious, that I must tell you all about him. Once upon a time, a worthy merchant of London, named GILBERT A BECKET, made a pilgrimage to the Holy Land, and was taken prisoner by a Saracen lord. This lord, who treated him kindly and not like a slave, had one fair daughter, who fell in love with the merchant; and who told him that she wanted to become a Christian, and was willing to marry him if they could fly to a Christian country. The merchant returned her love, until he found an opportunity to escape, when he did not trouble himself about the Saracen lady, but escaped with his servant Richard, who had been taken prisoner along with him, and arrived in England and forgot her. The Saracen lady, who was more loving than the merchant, left her father's house in disguise to follow him, and made her way, under many hardships, to the sea-shore. The merchant had taught her only two English words (for I suppose he must have learnt the Saracen tongue himself, and made love in that language), of which LONDON was one, and his own name, GILBERT, the other. She went among the ships, saying, 'London! London!' over and over again, until the sailors understood that she wanted to find an English vessel that would carry her there; so they showed her such a ship, and she paid for her passage with some of her jewels, and sailed away. Well! The merchant was sitting in his counting-house in London one day, when he heard a great noise in the street; and presently Richard came running in from the warehouse, with his eyes wide open and his breath almost gone, saying, 'Master, master, here is the Saracen lady!' The merchant thought Richard was mad; but Richard said, 'No, master! As I live, the Saracen lady is going up and down the city, calling Gilbert! Gilbert!' Then, he took the merchant by the sleeve, and pointed out of window; and there they saw her among the gables and water-spouts of the dark, dirty street, in her foreign dress, so forlorn, surrounded by a wondering crowd, and passing slowly along, calling Gilbert, Gilbert! When the merchant saw her, and thought of the tenderness she had shown him in his captivity, and of her constancy, his heart was moved, and he ran down into the street; and she saw him coming, and with a great cry fainted in his arms. They were married without loss of time, and Richard (who was an excellent man) danced with joy the whole day of the wedding; and they all lived happy ever afterwards. This merchant and this Saracen lady had one son, THOMAS A BECKET. He it was who became the Favourite of King Henry the Second. He had become Chancellor, when the King thought of making him Archbishop. He was clever, gay, well educated, brave; had fought in several battles in France; had defeated a French knight in single combat, and brought his horse away as a token of the victory. He lived in a noble palace, he was the tutor of the young Prince Henry, he was served by one hundred and forty knights, his riches were immense. The King once sent him as his ambassador to France; and the French people, beholding in what state he travelled, cried out in the streets, 'How splendid must the King of England be, when this is only the Chancellor!' They had good reason to wonder at the magnificence of Thomas a Becket, for, when he entered a French town, his procession was headed by two hundred and fifty singing boys; then, came his hounds in couples; then, eight waggons, each drawn by five horses driven by five drivers: two of the waggons filled with strong ale to be given away to the people; four, with his gold and silver plate and stately clothes; two, with the dresses of his numerous servants. Then, came twelve horses, each with a monkey on his back; then, a train of people bearing shields and leading fine war-horses splendidly equipped; then, falconers with hawks upon their wrists; then, a host of knights, and gentlemen and priests; then, the Chancellor with his brilliant garments flashing in the sun, and all the people capering and shouting with delight. The King was well pleased with all this, thinking that it only made himself the more magnificent to have so magnificent a favourite; but he sometimes jested with the Chancellor upon his splendour too. Once, when they were riding together through the streets of London in hard winter weather, they saw a shivering old man in rags. 'Look at the poor object!' said the King. 'Would it not be a charitable act to give that aged man a comfortable warm cloak?' 'Undoubtedly it would,' said Thomas a Becket, 'and you do well, Sir, to think of such Christian duties.' 'Come!' cried the King, 'then give him your cloak!' It was made of rich crimson trimmed with ermine. 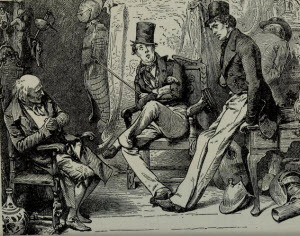 The King tried to pull it off, the Chancellor tried to keep it on, both were near rolling from their saddles in the mud, when the Chancellor submitted, and the King gave the cloak to the old beggar: much to the beggar's astonishment, and much to the merriment of all the courtiers in attendance. For, courtiers are not only eager to laugh when the King laughs, but they really do enjoy a laugh against a Favourite. 'I will make,' thought King Henry the second, 'this Chancellor of mine, Thomas a Becket, Archbishop of Canterbury. He will then be the head of the Church, and, being devoted to me, will help me to correct the Church. He has always upheld my power against the power of the clergy, and once publicly told some bishops (I remember), that men of the Church were equally bound to me, with men of the sword. Thomas a Becket is the man, of all other men in England, to help me in my great design.' So the King, regardless of all objection, either that he was a fighting man, or a lavish man, or a courtly man, or a man of pleasure, or anything but a likely man for the office, made him Archbishop accordingly. Now, Thomas a Becket was proud and loved to be famous. He was already famous for the pomp of his life, for his riches, his gold and silver plate, his waggons, horses, and attendants. He could do no more in that way than he had done; and being tired of that kind of fame (which is a very poor one), he longed to have his name celebrated for something else. Nothing, he knew, would render him so famous in the world, as the setting of his utmost power and ability against the utmost power and ability of the King. He resolved with the whole strength of his mind to do it. He may have had some secret grudge against the King besides. The King may have offended his proud humour at some time or other, for anything I know. I think it likely, because it is a common thing for Kings, Princes, and other great people, to try the tempers of their favourites rather severely. Even the little affair of the crimson cloak must have been anything but a pleasant one to a haughty man. Thomas a Becket knew better than any one in England what the King expected of him. In all his sumptuous life, he had never yet been in a position to disappoint the King. He could take up that proud stand now, as head of the Church; and he determined that it should be written in history, either that he subdued the King, or that the King subdued him. So, of a sudden, he completely altered the whole manner of his life. He turned off all his brilliant followers, ate coarse food, drank bitter water, wore next his skin sackcloth covered with dirt and vermin (for it was then thought very religious to be very dirty), flogged his back to punish himself, lived chiefly in a little cell, washed the feet of thirteen poor people every day, and looked as miserable as he possibly could. If he had put twelve hundred monkeys on horseback instead of twelve, and had gone in procession with eight thousand waggons instead of eight, he could not have half astonished the people so much as by this great change. It soon caused him to be more talked about as an Archbishop than he had been as a Chancellor. The King was very angry; and was made still more so, when the new Archbishop, claiming various estates from the nobles as being rightfully Church property, required the King himself, for the same reason, to give up Rochester Castle, and Rochester City too. Not satisfied with this, he declared that no power but himself should appoint a priest to any Church in the part of England over which he was Archbishop; and when a certain gentleman of Kent made such an appointment, as he claimed to have the right to do, Thomas a Becket excommunicated him. The quarrel went on. A priest in Worcestershire committed a most dreadful murder, that aroused the horror of the whole nation. The King demanded to have this wretch delivered up, to be tried in the same court and in the same way as any other murderer. The Archbishop refused, and kept him in the Bishop's prison. The King, holding a solemn assembly in Westminster Hall, demanded that in future all priests found guilty before their Bishops of crimes against the law of the land should be considered priests no longer, and should be delivered over to the law of the land for punishment. The Archbishop again refused. The King required to know whether the clergy would obey the ancient customs of the country? Every priest there, but one, said, after Thomas a Becket, 'Saving my order.' This really meant that they would only obey those customs when they did not interfere with their own claims; and the King went out of the Hall in great wrath. Some of the clergy began to be afraid, now, that they were going too far. Though Thomas a Becket was otherwise as unmoved as Westminster Hall, they prevailed upon him, for the sake of their fears, to go to the King at Woodstock, and promise to observe the ancient customs of the country, without saying anything about his order. The King received this submission favourably, and summoned a great council of the clergy to meet at the Castle of Clarendon, by Salisbury. But when the council met, the Archbishop again insisted on the words 'saying my order;' and he still insisted, though lords entreated him, and priests wept before him and knelt to him, and an adjoining room was thrown open, filled with armed soldiers of the King, to threaten him. At length he gave way, for that time, and the ancient customs (which included what the King had demanded in vain) were stated in writing, and were signed and sealed by the chief of the clergy, and were called the Constitutions of Clarendon. The quarrel went on, for all that. The Archbishop tried to see the King. The King would not see him. The Archbishop tried to escape from England. The sailors on the coast would launch no boat to take him away. Then, he again resolved to do his worst in opposition to the King, and began openly to set the ancient customs at defiance. The King summoned him before a great council at Northampton, where he accused him of high treason, and made a claim against him, which was not a just one, for an enormous sum of money. Thomas a Becket was alone against the whole assembly, and the very Bishops advised him to resign his office and abandon his contest with the King. His great anxiety and agitation stretched him on a sick-bed for two days, but he was still undaunted. He went to the adjourned council, carrying a great cross in his right hand, and sat down holding it erect before him. The King angrily retired into an inner room. The whole assembly angrily retired and left him there. But there he sat. The Bishops came out again in a body, and renounced him as a traitor. He only said, 'I hear!' and sat there still. They retired again into the inner room, and his trial proceeded without him. By-and-by, the Earl of Leicester, heading the barons, came out to read his sentence. He refused to hear it, denied the power of the court, and said he would refer his cause to the Pope. As he walked out of the hall, with the cross in his hand, some of those present picked up rushes--rushes were strewn upon the floors in those days by way of carpet--and threw them at him. He proudly turned his head, and said that were he not Archbishop, he would chastise those cowards with the sword he had known how to use in bygone days. He then mounted his horse, and rode away, cheered and surrounded by the common people, to whom he threw open his house that night and gave a supper, supping with them himself. That same night he secretly departed from the town; and so, travelling by night and hiding by day, and calling himself 'Brother Dearman,' got away, not without difficulty, to Flanders. The struggle still went on. The angry King took possession of the revenues of the archbishopric, and banished all the relations and servants of Thomas a Becket, to the number of four hundred. The Pope and the French King both protected him, and an abbey was assigned for his residence. Stimulated by this support, Thomas a Becket, on a great festival day, formally proceeded to a great church crowded with people, and going up into the pulpit publicly cursed and excommunicated all who had supported the Constitutions of Clarendon: mentioning many English noblemen by name, and not distantly hinting at the King of England himself. When intelligence of this new affront was carried to the King in his chamber, his passion was so furious that he tore his clothes, and rolled like a madman on his bed of straw and rushes. But he was soon up and doing. He ordered all the ports and coasts of England to be narrowly watched, that no letters of Interdict might be brought into the kingdom; and sent messengers and bribes to the Pope's palace at Rome. Meanwhile, Thomas a Becket, for his part, was not idle at Rome, but constantly employed his utmost arts in his own behalf. Thus the contest stood, until there was peace between France and England (which had been for some time at war), and until the two children of the two Kings were married in celebration of it. Then, the French King brought about a meeting between Henry and his old favourite, so long his enemy. Even then, though Thomas a Becket knelt before the King, he was obstinate and immovable as to those words about his order. King Louis of France was weak enough in his veneration for Thomas a Becket and such men, but this was a little too much for him. He said that a Becket 'wanted to be greater than the saints and better than St. Peter,' and rode away from him with the King of England. His poor French Majesty asked a Becket's pardon for so doing, however, soon afterwards, and cut a very pitiful figure. At last, and after a world of trouble, it came to this. There was another meeting on French ground between King Henry and Thomas a Becket, and it was agreed that Thomas a Becket should be Archbishop of Canterbury, according to the customs of former Archbishops, and that the King should put him in possession of the revenues of that post. And now, indeed, you might suppose the struggle at an end, and Thomas a Becket at rest. NO, not even yet. For Thomas a Becket hearing, by some means, that King Henry, when he was in dread of his kingdom being placed under an interdict, had had his eldest son Prince Henry secretly crowned, not only persuaded the Pope to suspend the Archbishop of York who had performed that ceremony, and to excommunicate the Bishops who had assisted at it, but sent a messenger of his own into England, in spite of all the King's precautions along the coast, who delivered the letters of excommunication into the Bishops' own hands. Thomas a Becket then came over to England himself, after an absence of seven years. He was privately warned that it was dangerous to come, and that an ireful knight, named RANULF DE BROC, had threatened that he should not live to eat a loaf of bread in England; but he came. The common people received him well, and marched about with him in a soldierly way, armed with such rustic weapons as they could get. He tried to see the young prince who had once been his pupil, but was prevented. He hoped for some little support among the nobles and priests, but found none. He made the most of the peasants who attended him, and feasted them, and went from Canterbury to Harrow-on-the-Hill, and from Harrow-on-the-Hill back to Canterbury, and on Christmas Day preached in the Cathedral there, and told the people in his sermon that he had come to die among them, and that it was likely he would be murdered. He had no fear, however--or, if he had any, he had much more obstinacy--for he, then and there, excommunicated three of his enemies, of whom Ranulf de Broc, the ireful knight, was one. As men in general had no fancy for being cursed, in their sitting and walking, and gaping and sneezing, and all the rest of it, it was very natural in the persons so freely excommunicated to complain to the King. It was equally natural in the King, who had hoped that this troublesome opponent was at last quieted, to fall into a mighty rage when he heard of these new affronts; and, on the Archbishop of York telling him that he never could hope for rest while Thomas a Becket lived, to cry out hastily before his court, 'Have I no one here who will deliver me from this man?' There were four knights present, who, hearing the King's words, looked at one another, and went out. The names of these knights were REGINALD FITZURSE, WILLIAM TRACY, HUGH DE MORVILLE, and RICHARD BRITO; three of whom had been in the train of Thomas a Becket in the old days of his splendour. They rode away on horseback, in a very secret manner, and on the third day after Christmas Day arrived at Saltwood House, not far from Canterbury, which belonged to the family of Ranulf de Broc. They quietly collected some followers here, in case they should need any; and proceeding to Canterbury, suddenly appeared (the four knights and twelve men) before the Archbishop, in his own house, at two o'clock in the afternoon. They neither bowed nor spoke, but sat down on the floor in silence, staring at the Archbishop. 'We want,' said Reginald Fitzurse, 'the excommunication taken from the Bishops, and you to answer for your offences to the King.' Thomas a Becket defiantly replied, that the power of the clergy was above the power of the King. That it was not for such men as they were, to threaten him. That if he were threatened by all the swords in England, he would never yield. 'Then we will do more than threaten!' said the knights. And they went out with the twelve men, and put on their armour, and drew their shining swords, and came back. His servants, in the meantime, had shut up and barred the great gate of the palace. At first, the knights tried to shatter it with their battle- axes; but, being shown a window by which they could enter, they let the gate alone, and climbed in that way. While they were battering at the door, the attendants of Thomas a Becket had implored him to take refuge in the Cathedral; in which, as a sanctuary or sacred place, they thought the knights would dare to do no violent deed. He told them, again and again, that he would not stir. Hearing the distant voices of the monks singing the evening service, however, he said it was now his duty to attend, and therefore, and for no other reason, he would go. There was a near way between his Palace and the Cathedral, by some beautiful old cloisters which you may yet see. He went into the Cathedral, without any hurry, and having the Cross carried before him as usual. When he was safely there, his servants would have fastened the door, but he said NO! it was the house of God and not a fortress. As he spoke, the shadow of Reginald Fitzurse appeared in the Cathedral doorway, darkening the little light there was outside, on the dark winter evening. This knight said, in a strong voice, 'Follow me, loyal servants of the King!' The rattle of the armour of the other knights echoed through the Cathedral, as they came clashing in. It was so dark, in the lofty aisles and among the stately pillars of the church, and there were so many hiding-places in the crypt below and in the narrow passages above, that Thomas a Becket might even at that pass have saved himself if he would. But he would not. He told the monks resolutely that he would not. And though they all dispersed and left him there with no other follower than EDWARD GRYME, his faithful cross-bearer, he was as firm then, as ever he had been in his life. The knights came on, through the darkness, making a terrible noise with their armed tread upon the stone pavement of the church. 'Where is the traitor?' they cried out. He made no answer. But when they cried, 'Where is the Archbishop?' he said proudly, 'I am here!' and came out of the shade and stood before them. The knights had no desire to kill him, if they could rid the King and themselves of him by any other means. They told him he must either fly or go with them. He said he would do neither; and he threw William Tracy off with such force when he took hold of his sleeve, that Tracy reeled again. 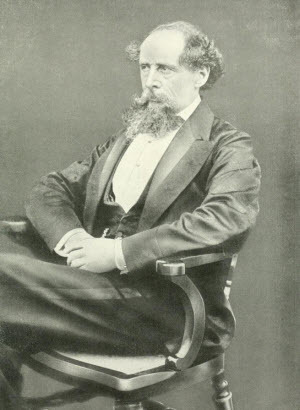 By his reproaches and his steadiness, he so incensed them, and exasperated their fierce humour, that Reginald Fitzurse, whom he called by an ill name, said, 'Then die!' and struck at his head. But the faithful Edward Gryme put out his arm, and there received the main force of the blow, so that it only made his master bleed. Another voice from among the knights again called to Thomas a Becket to fly; but, with his blood running down his face, and his hands clasped, and his head bent, he commanded himself to God, and stood firm. Then they cruelly killed him close to the altar of St. Bennet; and his body fell upon the pavement, which was dirtied with his blood and brains. It is an awful thing to think of the murdered mortal, who had so showered his curses about, lying, all disfigured, in the church, where a few lamps here and there were but red specks on a pall of darkness; and to think of the guilty knights riding away on horseback, looking over their shoulders at the dim Cathedral, and remembering what they had left inside. When the King heard how Thomas a Becket had lost his life in Canterbury Cathedral, through the ferocity of the four Knights, he was filled with dismay. Some have supposed that when the King spoke those hasty words, 'Have I no one here who will deliver me from this man?' he wished, and meant a Becket to be slain. But few things are more unlikely; for, besides that the King was not naturally cruel (though very passionate), he was wise, and must have known full well what any stupid man in his dominions must have known, namely, that such a murder would rouse the Pope and the whole Church against him. He sent respectful messengers to the Pope, to represent his innocence (except in having uttered the hasty words); and he swore solemnly and publicly to his innocence, and contrived in time to make his peace. As to the four guilty Knights, who fled into Yorkshire, and never again dared to show themselves at Court, the Pope excommunicated them; and they lived miserably for some time, shunned by all their countrymen. At last, they went humbly to Jerusalem as a penance, and there died and were buried. It happened, fortunately for the pacifying of the Pope, that an opportunity arose very soon after the murder of a Becket, for the King to declare his power in Ireland--which was an acceptable undertaking to the Pope, as the Irish, who had been converted to Christianity by one Patricius (otherwise Saint Patrick) long ago, before any Pope existed, considered that the Pope had nothing at all to do with them, or they with the Pope, and accordingly refused to pay him Peter's Pence, or that tax of a penny a house which I have elsewhere mentioned. The King's opportunity arose in this way. The Irish were, at that time, as barbarous a people as you can well imagine. They were continually quarrelling and fighting, cutting one another's throats, slicing one another's noses, burning one another's houses, carrying away one another's wives, and committing all sorts of violence. The country was divided into five kingdoms--DESMOND, THOMOND, CONNAUGHT, ULSTER, and LEINSTER--each governed by a separate King, of whom one claimed to be the chief of the rest. Now, one of these Kings, named DERMOND MAC MURROUGH (a wild kind of name, spelt in more than one wild kind of way), had carried off the wife of a friend of his, and concealed her on an island in a bog. The friend resenting this (though it was quite the custom of the country), complained to the chief King, and, with the chief King's help, drove Dermond Mac Murrough out of his dominions. Dermond came over to England for revenge; and offered to hold his realm as a vassal of King Henry, if King Henry would help him to regain it. The King consented to these terms; but only assisted him, then, with what were called Letters Patent, authorising any English subjects who were so disposed, to enter into his service, and aid his cause. There was, at Bristol, a certain EARL RICHARD DE CLARE, called STRONGBOW; of no very good character; needy and desperate, and ready for anything that offered him a chance of improving his fortunes. There were, in South Wales, two other broken knights of the same good-for-nothing sort, called ROBERT FITZ-STEPHEN, and MAURICE FITZ-GERALD. These three, each with a small band of followers, took up Dermond's cause; and it was agreed that if it proved successful, Strongbow should marry Dermond's daughter EVA, and be declared his heir. The trained English followers of these knights were so superior in all the discipline of battle to the Irish, that they beat them against immense superiority of numbers. In one fight, early in the war, they cut off three hundred heads, and laid them before Mac Murrough; who turned them every one up with his hands, rejoicing, and, coming to one which was the head of a man whom he had much disliked, grasped it by the hair and ears, and tore off the nose and lips with his teeth. You may judge from this, what kind of a gentleman an Irish King in those times was. The captives, all through this war, were horribly treated; the victorious party making nothing of breaking their limbs, and casting them into the sea from the tops of high rocks. It was in the midst of the miseries and cruelties attendant on the taking of Waterford, where the dead lay piled in the streets, and the filthy gutters ran with blood, that Strongbow married Eva. An odious marriage-company those mounds of corpse's must have made, I think, and one quite worthy of the young lady's father. He died, after Waterford and Dublin had been taken, and various successes achieved; and Strongbow became King of Leinster. Now came King Henry's opportunity. To restrain the growing power of Strongbow, he himself repaired to Dublin, as Strongbow's Royal Master, and deprived him of his kingdom, but confirmed him in the enjoyment of great possessions. The King, then, holding state in Dublin, received the homage of nearly all the Irish Kings and Chiefs, and so came home again with a great addition to his reputation as Lord of Ireland, and with a new claim on the favour of the Pope. And now, their reconciliation was completed--more easily and mildly by the Pope, than the King might have expected, I think. At this period of his reign, when his troubles seemed so few and his prospects so bright, those domestic miseries began which gradually made the King the most unhappy of men, reduced his great spirit, wore away his health, and broke his heart. First, he demanded that his young wife, MARGARET, the French King's daughter, should be crowned as well as he. His father, the King, consented, and it was done. It was no sooner done, than he demanded to have a part of his father's dominions, during his father's life. 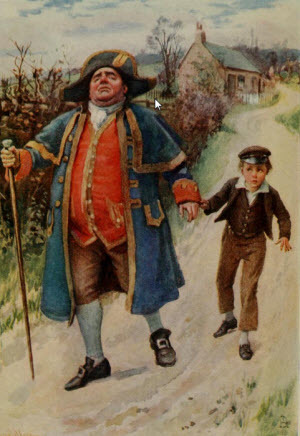 This being refused, he made off from his father in the night, with his bad heart full of bitterness, and took refuge at the French King's Court. Within a day or two, his brothers Richard and Geoffrey followed. Their mother tried to join them--escaping in man's clothes--but she was seized by King Henry's men, and immured in prison, where she lay, deservedly, for sixteen years. Every day, however, some grasping English noblemen, to whom the King's protection of his people from their avarice and oppression had given offence, deserted him and joined the Princes. Every day he heard some fresh intelligence of the Princes levying armies against him; of Prince Henry's wearing a crown before his own ambassadors at the French Court, and being called the Junior King of England; of all the Princes swearing never to make peace with him, their father, without the consent and approval of the Barons of France. But, with his fortitude and energy unshaken, King Henry met the shock of these disasters with a resolved and cheerful face. He called upon all Royal fathers who had sons, to help him, for his cause was theirs; he hired, out of his riches, twenty thousand men to fight the false French King, who stirred his own blood against him; and he carried on the war with such vigour, that Louis soon proposed a conference to treat for peace. The conference was held beneath an old wide-spreading green elm-tree, upon a plain in France. It led to nothing. The war recommenced. Prince Richard began his fighting career, by leading an army against his father; but his father beat him and his army back; and thousands of his men would have rued the day in which they fought in such a wicked cause, had not the King received news of an invasion of England by the Scots, and promptly come home through a great storm to repress it. And whether he really began to fear that he suffered these troubles because a Becket had been murdered; or whether he wished to rise in the favour of the Pope, who had now declared a Becket to be a saint, or in the favour of his own people, of whom many believed that even a Becket's senseless tomb could work miracles, I don't know: but the King no sooner landed in England than he went straight to Canterbury; and when he came within sight of the distant Cathedral, he dismounted from his horse, took off his shoes, and walked with bare and bleeding feet to a Becket's grave. There, he lay down on the ground, lamenting, in the presence of many people; and by-and- by he went into the Chapter House, and, removing his clothes from his back and shoulders, submitted himself to be beaten with knotted cords (not beaten very hard, I dare say though) by eighty Priests, one after another. It chanced that on the very day when the King made this curious exhibition of himself, a complete victory was obtained over the Scots; which very much delighted the Priests, who said that it was won because of his great example of repentance. For the Priests in general had found out, since a Becket's death, that they admired him of all things--though they had hated him very cordially when he was alive. The Earl of Flanders, who was at the head of the base conspiracy of the King's undutiful sons and their foreign friends, took the opportunity of the King being thus employed at home, to lay siege to Rouen, the capital of Normandy. But the King, who was extraordinarily quick and active in all his movements, was at Rouen, too, before it was supposed possible that he could have left England; and there he so defeated the said Earl of Flanders, that the conspirators proposed peace, and his bad sons Henry and Geoffrey submitted. Richard resisted for six weeks; but, being beaten out of castle after castle, he at last submitted too, and his father forgave him. To forgive these unworthy princes was only to afford them breathing-time for new faithlessness. They were so false, disloyal, and dishonourable, that they were no more to be trusted than common thieves. In the very next year, Prince Henry rebelled again, and was again forgiven. In eight years more, Prince Richard rebelled against his elder brother; and Prince Geoffrey infamously said that the brothers could never agree well together, unless they were united against their father. In the very next year after their reconciliation by the King, Prince Henry again rebelled against his father; and again submitted, swearing to be true; and was again forgiven; and again rebelled with Geoffrey. But the end of this perfidious Prince was come. He fell sick at a French town; and his conscience terribly reproaching him with his baseness, he sent messengers to the King his father, imploring him to come and see him, and to forgive him for the last time on his bed of death. The generous King, who had a royal and forgiving mind towards his children always, would have gone; but this Prince had been so unnatural, that the noblemen about the King suspected treachery, and represented to him that he could not safely trust his life with such a traitor, though his own eldest son. Therefore the King sent him a ring from off his finger as a token of forgiveness; and when the Prince had kissed it, with much grief and many tears, and had confessed to those around him how bad, and wicked, and undutiful a son he had been; he said to the attendant Priests: 'O, tie a rope about my body, and draw me out of bed, and lay me down upon a bed of ashes, that I may die with prayers to God in a repentant manner!' And so he died, at twenty-seven years old. Three years afterwards, Prince Geoffrey, being unhorsed at a tournament, had his brains trampled out by a crowd of horses passing over him. So, there only remained Prince Richard, and Prince John--who had grown to be a young man now, and had solemnly sworn to be faithful to his father. Richard soon rebelled again, encouraged by his friend the French King, PHILIP THE SECOND (son of Louis, who was dead); and soon submitted and was again forgiven, swearing on the New Testament never to rebel again; and in another year or so, rebelled again; and, in the presence of his father, knelt down on his knee before the King of France; and did the French King homage: and declared that with his aid he would possess himself, by force, of all his father's French dominions. And yet this Richard called himself a soldier of Our Saviour! And yet this Richard wore the Cross, which the Kings of France and England had both taken, in the previous year, at a brotherly meeting underneath the old wide-spreading elm-tree on the plain, when they had sworn (like him) to devote themselves to a new Crusade, for the love and honour of the Truth! Sick at heart, wearied out by the falsehood of his sons, and almost ready to lie down and die, the unhappy King who had so long stood firm, began to fail. But the Pope, to his honour, supported him; and obliged the French King and Richard, though successful in fight, to treat for peace. Richard wanted to be Crowned King of England, and pretended that he wanted to be married (which he really did not) to the French King's sister, his promised wife, whom King Henry detained in England. King Henry wanted, on the other hand, that the French King's sister should be married to his favourite son, John: the only one of his sons (he said) who had never rebelled against him. At last King Henry, deserted by his nobles one by one, distressed, exhausted, broken-hearted, consented to establish peace. One final heavy sorrow was reserved for him, even yet. When they brought him the proposed treaty of peace, in writing, as he lay very ill in bed, they brought him also the list of the deserters from their allegiance, whom he was required to pardon. The first name upon this list was John, his favourite son, in whom he had trusted to the last. After a time, he told his attendants to take him to the French town of Chinon--a town he had been fond of, during many years. But he was fond of no place now; it was too true that he could care for nothing more upon this earth. He wildly cursed the hour when he was born, and cursed the children whom he left behind him; and expired. As, one hundred years before, the servile followers of the Court had abandoned the Conqueror in the hour of his death, so they now abandoned his descendant. The very body was stripped, in the plunder of the Royal chamber; and it was not easy to find the means of carrying it for burial to the abbey church of Fontevraud. Richard was said in after years, by way of flattery, to have the heart of a Lion. It would have been far better, I think, to have had the heart of a Man. His heart, whatever it was, had cause to beat remorsefully within his breast, when he came--as he did--into the solemn abbey, and looked on his dead father's uncovered face. His heart, whatever it was, had been a black and perjured heart, in all its dealings with the deceased King, and more deficient in a single touch of tenderness than any wild beast's in the forest. There is a pretty story told of this Reign, called the story of FAIR ROSAMOND. It relates how the King doted on Fair Rosamond, who was the loveliest girl in all the world; and how he had a beautiful Bower built for her in a Park at Woodstock; and how it was erected in a labyrinth, and could only be found by a clue of silk. 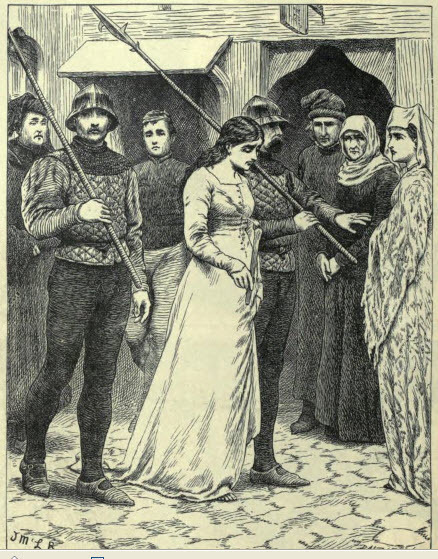 How the bad Queen Eleanor, becoming jealous of Fair Rosamond, found out the secret of the clue, and one day, appeared before her, with a dagger and a cup of poison, and left her to the choice between those deaths. How Fair Rosamond, after shedding many piteous tears and offering many useless prayers to the cruel Queen, took the poison, and fell dead in the midst of the beautiful bower, while the unconscious birds sang gaily all around her. Now, there was a fair Rosamond, and she was (I dare say) the loveliest girl in all the world, and the King was certainly very fond of her, and the bad Queen Eleanor was certainly made jealous. But I am afraid--I say afraid, because I like the story so much--that there was no bower, no labyrinth, no silken clue, no dagger, no poison. I am afraid fair Rosamond retired to a nunnery near Oxford, and died there, peaceably; her sister-nuns hanging a silken drapery over her tomb, and often dressing it with flowers, in remembrance of the youth and beauty that had enchanted the King when he too was young, and when his life lay fair before him. It was dark and ended now; faded and gone. Henry Plantagenet lay quiet in the abbey church of Fontevraud, in the fifty-seventh year of his age--never to be completed--after governing England well, for nearly thirty-five years.